The Carbolite BV-HTRV Bridgman Crystal Growth Furnace is as a special crystal growing furnace according to the Bridgman method. The Bridgman method uses a pre-synthesized material that moves slowly through a temperature gradient. The melted material moves through a decreasing temperature gradient and forms a single crystal. The BV-HTRV is a tube furnace which is mounted on a device engineered specifically for the Bridgman method. As a standard, the HTRV 70-250 or the HTRV 100-250 are used as a tube furnace mounted on the pulling device. In principal, every tube furnace can be mounted on the pulling device. Most common are the two models, HTRV 70-250 and the HTRV 100-250. The short heated length is an advantage as it creates an ideal gradient for the Bridgman method. The temperature decreases towards the bottom of the furnace. The pulling device moves the sample with an adjustable speed toward the lower temperature. Next to the sample is a thermocouple in order for an accurate reading of the sample temperature. Both, sample and probe thermocouple are attached to the bottom pulling device. The movement of the sample can be fast for loading and unloading or with a user defined speed for crystal growth. A ceramic tube surrounds the probe thermocouple and sample. At both ends of the tube, a water cooled flange is connected. At the top of the system, the tube and flange are fixed. A bellow connects the tube and pulling device at the bottom of the furnace. The bellow is extended during the downward movement of the sample. Operation of the unit can be achieved under vacuum conditions. At the top, the tube is connected to the vacuum pump. The valve towards the vacuum line is opened and closed manually. The vacuum level is controlled by a piezo measurement gauge. A manually operated rotameter allows purging of inert gas. To reduce the Oxygen value prior to the crystal growing process, evacuation and backflooding with an inert gas is performed several times. It is possible to connect a computer to the system in order to log all the relevant data of the process, i. e. position of the sample and temperature of the probe thermocouple. To load and unload the sample, the clamps must be opened. With the fast moving option, the sample is easily accessible. 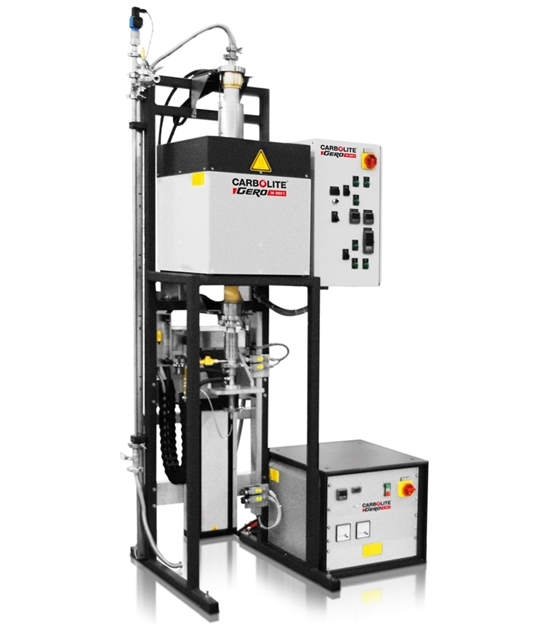 The pulling device that enables Bridgman type crystal growth can be combined with all single and multi-zone tube furnaces. 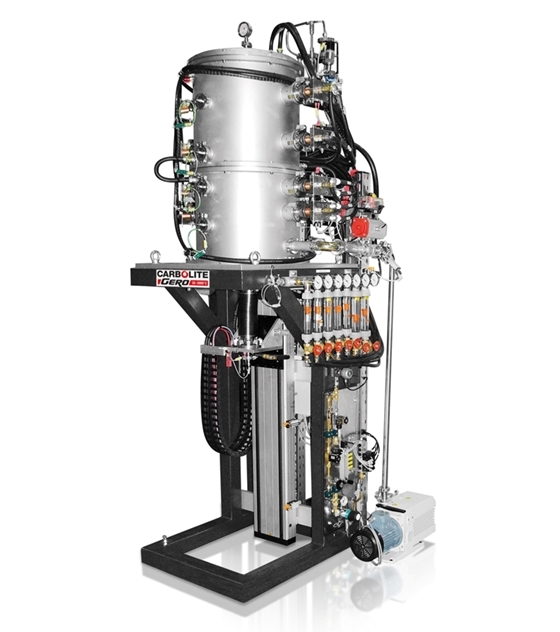 The Bridgman Crystal Growth Furnace includes heating elements of MoSi2 that are mounted in a vertical, hanging position and are surrounded by vacuum formed plates to insulate the heat from the housing. The housing is slotted to enable convection cooling of the casing. Depending on the melting point of the sample, the maximum temperature is designed up to 1600 °C, 1700 °C, or 1800 °C. For the pulling device, two motors with different transmission ratios are implemented. 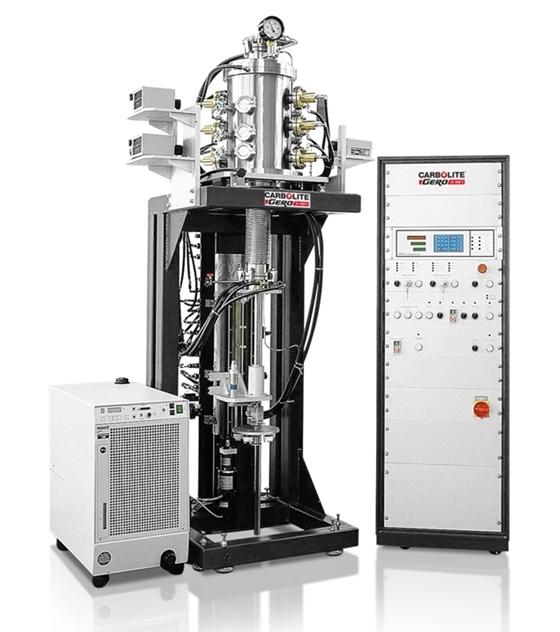 For instance, the fast moving of the samples is possible with a speed of approximately 10 mm/s, whereas the Bridgman crystal growing process, the pulling speed is only 0.00001 mm/s (10 nm/s). All connecting tubes of the lower water cooled flange are inserted in a drag chain. The control thermocouple is a type B thermocouple. An overtemperature thermocouple is optional and highly recommended as unattended operation is likely due to the long time period needed for the crystal growing process.